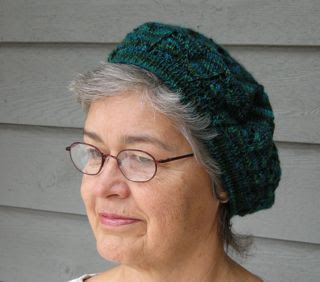 I found a wonderful lace pattern beret on ravelry by Kate Gagnon, called Springtime in Philadelphia Canopy, and made my interpretation of the hat out of handspun wool and silk. 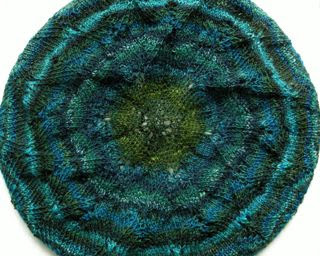 The roving is from Interlacements and is the Scottish Lichen colorway, which I absolutely love. My spinning, (completed a few years ago) is extremely inconsistent in size and was a bit of a problem but it came out pretty well. 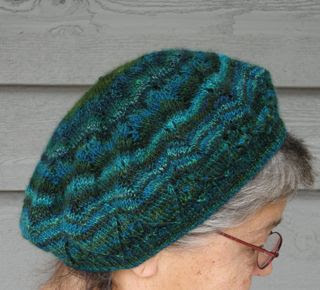 The tam is knit from the top down - so cool. It has a very nice hand to it, and is quite lightweight. What a beautiful beret! It really shows off the lovely colours in your handspun - a brilliant way to showcase a single skein of something lovely. 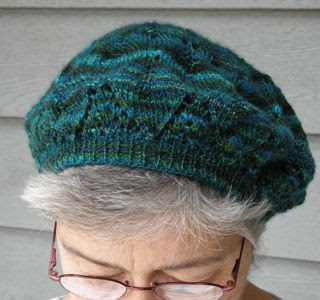 I'll definitely be adding this pattern to my ravelry queue - thanks for the inspiration!